First off, we are new to the world of Kumato tomatoes. Ted went grocery shopping out on the island Sunday and bought them. They come in a little long cardboard box which is wrapped in a sealed cello bag. 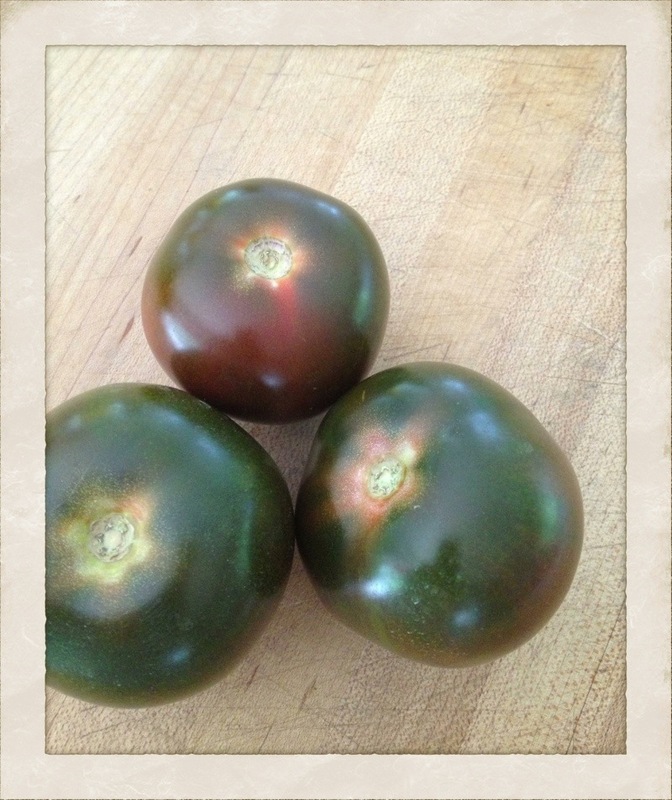 The tomatoes are incredibly uniform and are a beautiful greenish to brownish color. At first look, you would think they are unripe and would need to sit for days to ripen. Not is the case with these very unique Kumatoes. Once you slice into them, they are incredibly sweet. Within minutes we were sitting and enjoying them with our lunch. Last night I served them to our friend Jewel who is up from Eugene on business. TPS is out of town for work, so we had a lovely evening catching up. The tomatoes were just so tasty to have with cocktails. 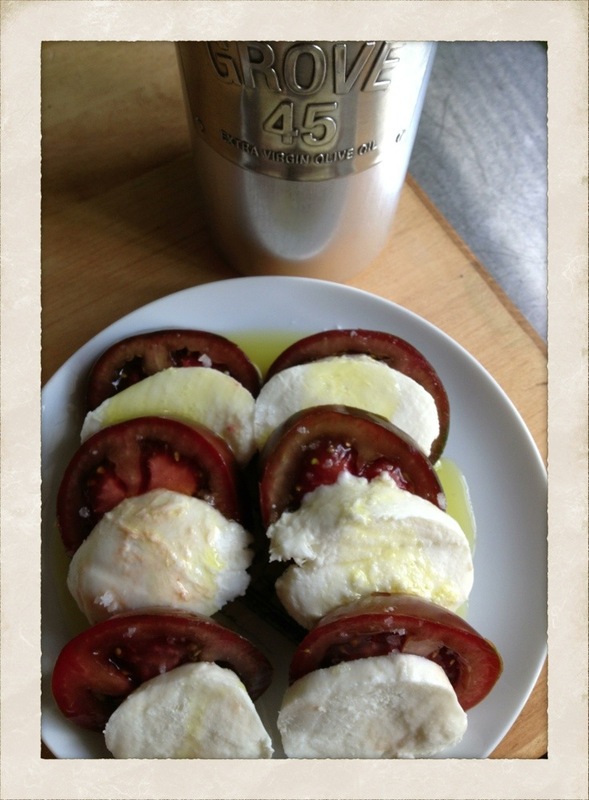 I made a Caprese of sorts, but omitted the basil as I really wanted the sweetness of the Kumato to shine through. I added a few pinches of Fleur de Sel to the sliced tomatoes, cut fresh mozzarella, layered the two, then dosed the whole lot with Grove 45 extra virgin olive oil. The tomato juices mixed with the EVOO when you cut into it all was just divine. Really the simplest, simplest thing. 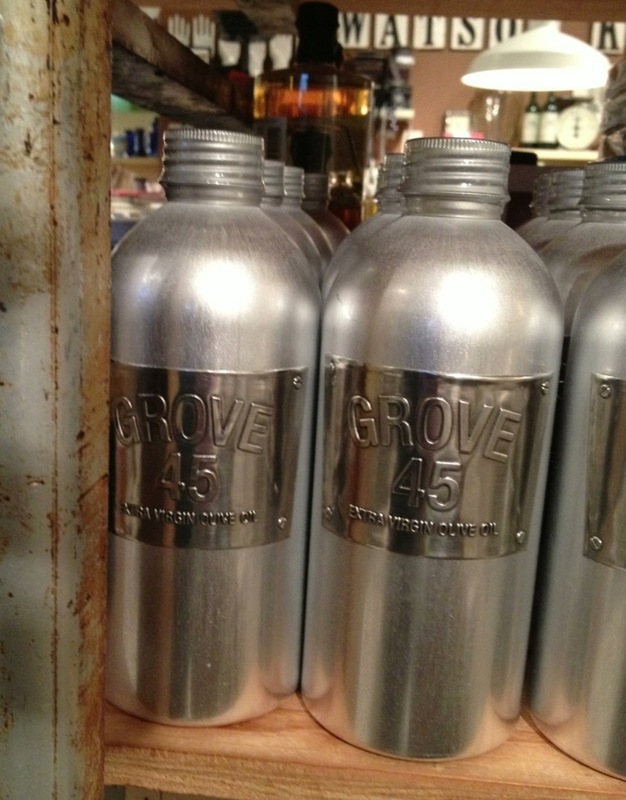 The New Batch of Grove 45 Has Arrived! I am quite excited to report that our 8 cases of stupendous Grove 45 Extra Virgin Olive Oil arrived the other day. When the FedEx delivery man walked in the door with the boxes and I saw ‘Grove 45’ marked on the side, my heart took an extra beat. This stuff, as I have reported before, is just pure bliss. We sold out of it by mid-November last year, and when it is gone, it is gone. So we have been eagerly awaiting fresh bottles from the new crop. I have been getting updates by the owners, Bonnie & Nena, via e-mail about the progress of the olive crop and when the EVOO would be bottled and labeled. Yes, that glorious bottle–as good looking as the amazing oil that is inside. Our shelves are now re-stocked, and I just love walking past the display knowing I will have some very happy customers. 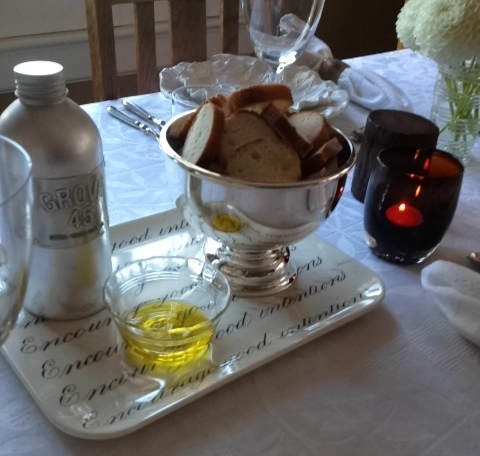 Last Friday, we hosted a dinner for the owners of Grove 45 Extra Virgin Olive Oil, Nena & Bonnie. The 2 had conducted a tasting of their EVOO at one of the shops earlier that day. We always love to have a meal to thank folks who make such an effort to do a book signing, demo their product or conduct a tasting. 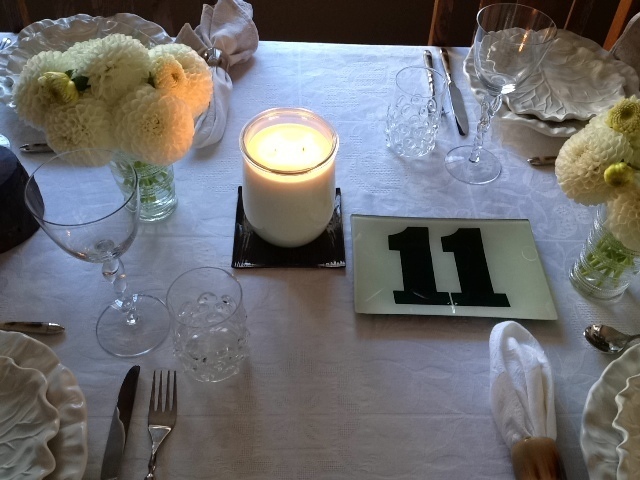 It is always so special to be invited to a home for dinner when we are traveling, so we do our darnedest to do the same. It was a gloriously sunny day, and beautiful night. 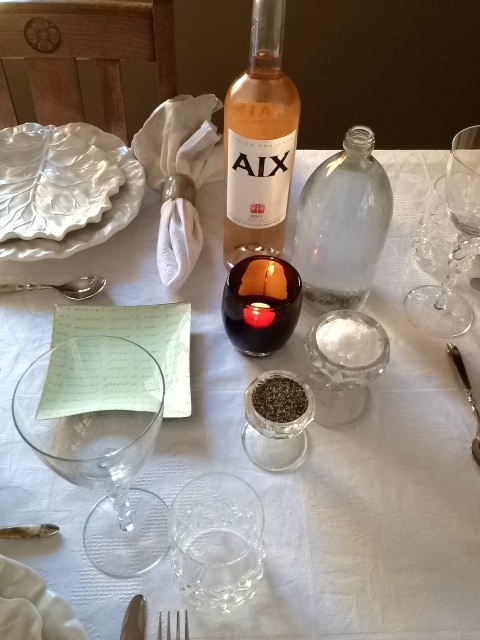 So nice and Summery in fact, that we thought we would stay with AIX Rosé that has been our favorite this season. 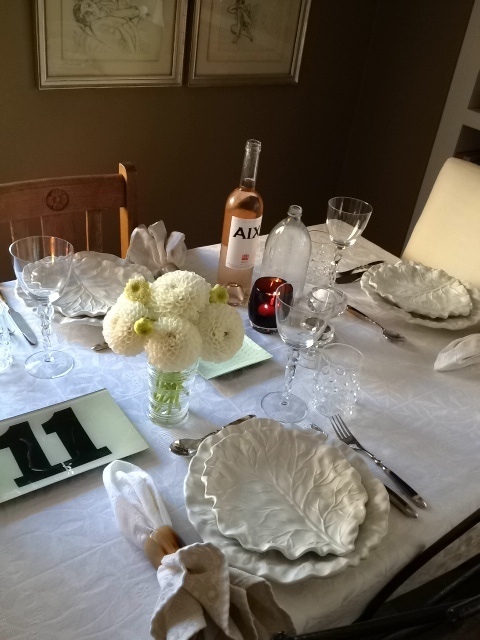 I tried to set the table around the look of the cool Grove 45 bottle. 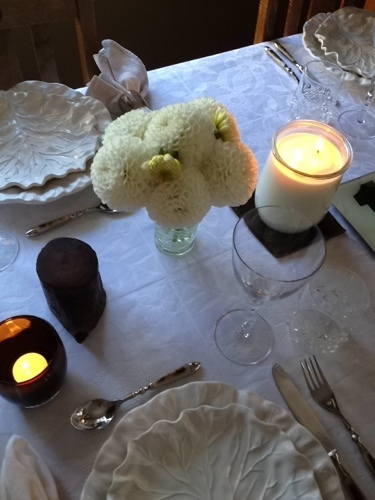 The white bulbous dahlias looked too good to pass up, and worked nicely bunched tightly in matching Juliska vases. 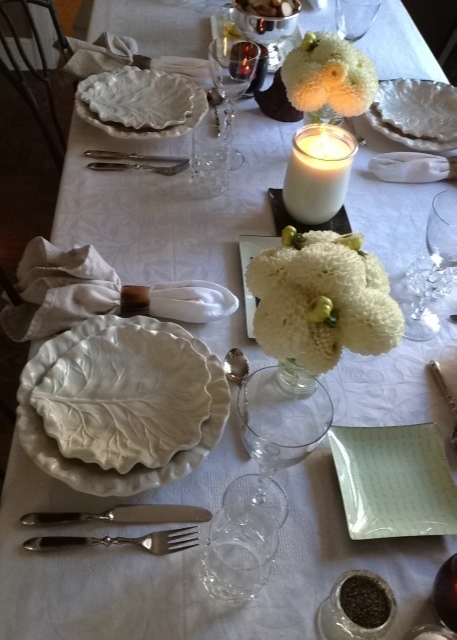 A variety of our John Derian platters would work well and create visual interest. A few smoky brown glassybaby along with a new candle we are testing out to see if we want to carry it at Watson Kennedy, would give us a flicker of light. 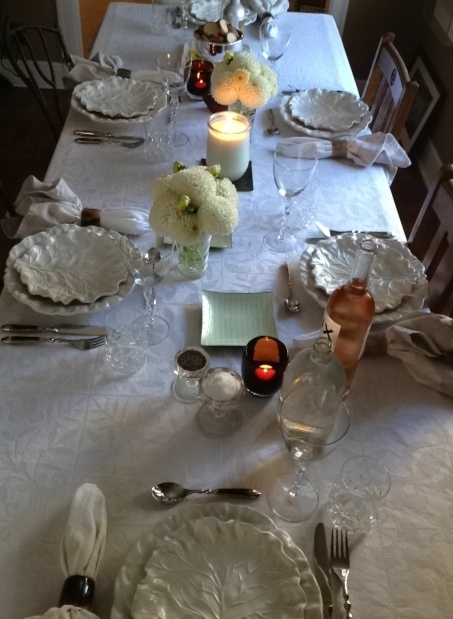 My favorite white plates, clear stemware and a new Le Jacquard Francais tablecloth would fill the rest of the table. All set! Ready for an evening filled with much laughter, many stories, and making new friends. For all of you Grove 45 Extra Virgin Olive Oil fans out there, if you are downtown tomorrow, please stop in. We will be conducting a tasting from 11 to 2 at our First & Spring location. The owners of Grove 45 will be in town so you can meet these 2 rock stars in the olive oil world and ask any questions you might have about their product. It promises to be a sunny day in Seattle, just right for a little extra virgin olive oil tasting. Hope to see you there. Ahhhhh, I am so happy to report that I have found an amazing source for just the dandiest vintage hotel silver. This has been close to the top of my list for quite some time. I chose some exquisite martini shakers and bowls to begin the collection at the shops and for the website. All the pieces have been expertly re-silvered, so they are the perfect piece for gifting as well as adding to your assortment of serving pieces & barware. Most are from grand hotels in England, with many engraved with the name. 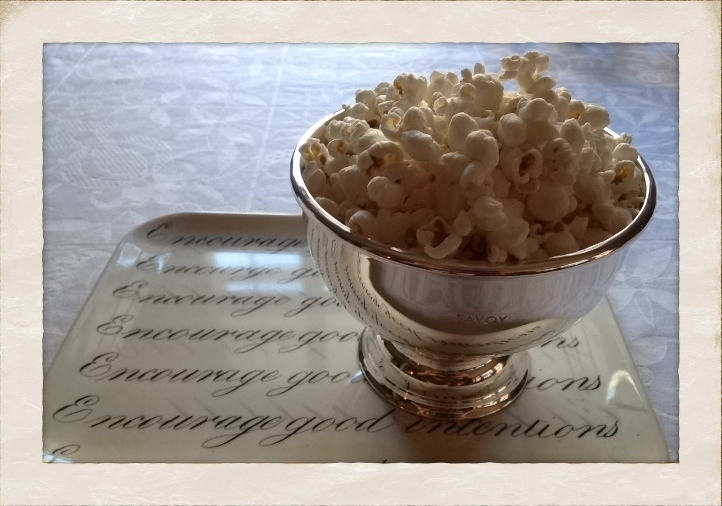 The above Savoy bowl was just too good not to add to our personal collection. It was just the right bowl to fill with popcorn and take up to the rooftop garden last eve, and have with our Friday night martini. 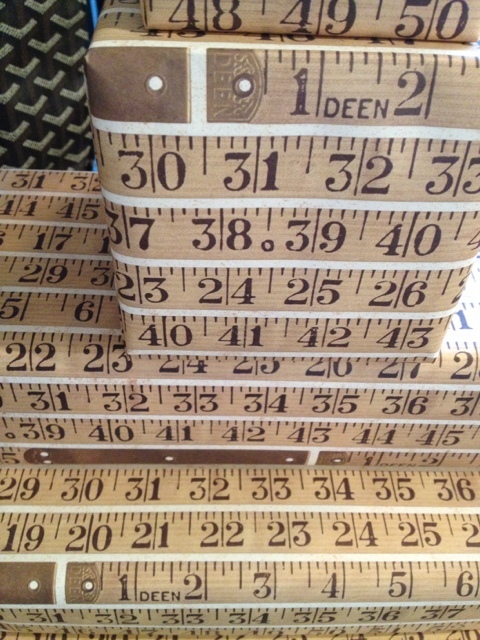 Look for pieces to arrive shortly, and for more and more to be added to the WK collection. Speaking of popcorn, if you are in the area next Friday from 11 to 2, please stop by the Home store location at First & Spring. The delightful owners of Grove 45 Extra Virgin Olive Oil will be in town conducting a tasting at the shop of their unbelievably tasty EVOO. We will be serving it drizzled over popcorn, as well as with French baguettes for dipping. A lovely beginning of September to all of you! 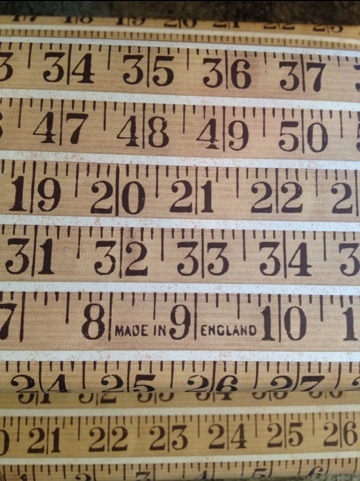 We sell a huge variety of wrapping paper at Watson Kennedy, but the wrap I am drawn to time and again, is this vintage English ruler motif that looks stellar on boxes of all sizes. It is made by an Italian paper company that produces generous over-sized sheets that make wrapping a number of gifts a snap. We had a dear, dear friend have a birthday last week-end, so it gave me a chance to wrap up her gifts with my favorite paper. 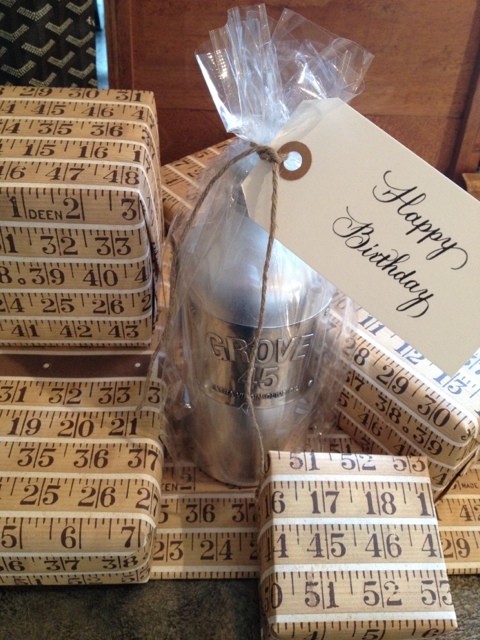 The ruler design working perfectly for a birthday, as the numbers on the rulers ties the whole birthday theme together. I like using the same wrapping paper for most to all of the gifts, so there is a cohesive grouping. The bottle of Grove 45 EVOO was just to handsome to cover up, so a cello bag would do the trick, tied off with a calligraphed greeting to mark the event. 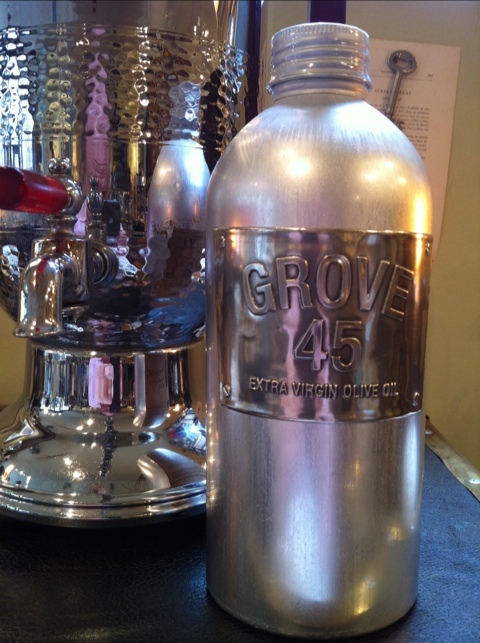 I could not wait to whip up something with the new Grove 45 EVOO we just got in. 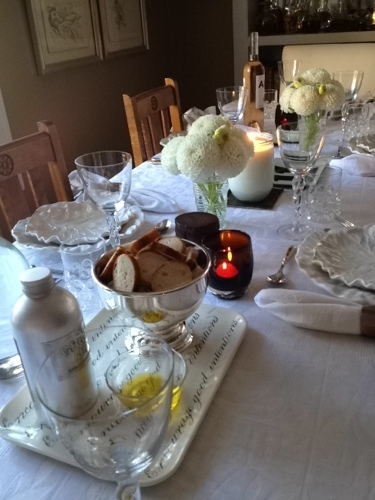 My goal was to use what we had, and make a simple supper. We almost always have a platter of tomatoes sitting out on the kitchen counter, and we had part of a yummy chunk of French feta sitting in the fridge that we had used for something last week-end. I like to keep a bag or 2 of orzo pasta in the cupboard–I love how quick & easy it is to make something tasty with it. I was off and running. Put small whole tomatoes, such as grape or cherry, in a baking dish and drizzle with a healthy amount of olive oil and salt. Roast for 20 to 25 minutes, till most of the tomatoes have popped and released their juices. Those juices, combined with the olive oil and salt is making the best sauce to later be absorbed into the pasta. 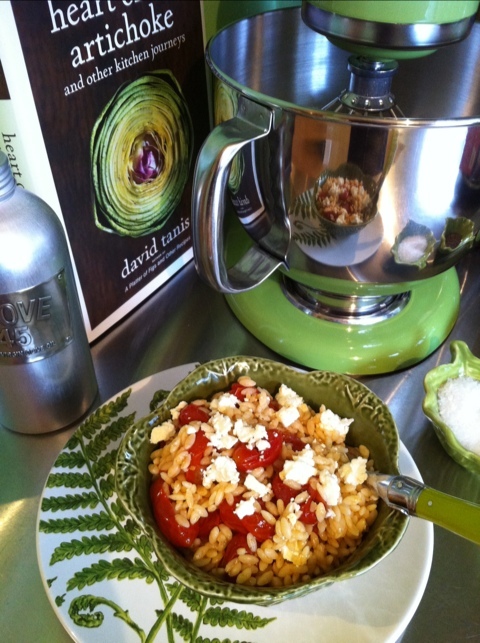 While the tomatoes are roasting, boil a salted pot of water, and cook the orzo pasta. Be sure to not overcook, leaving the pasta al dente. It will continue to cook when you add the hot tomato mixture. Once the pasta is done, drain, and put pasta into a bowl. 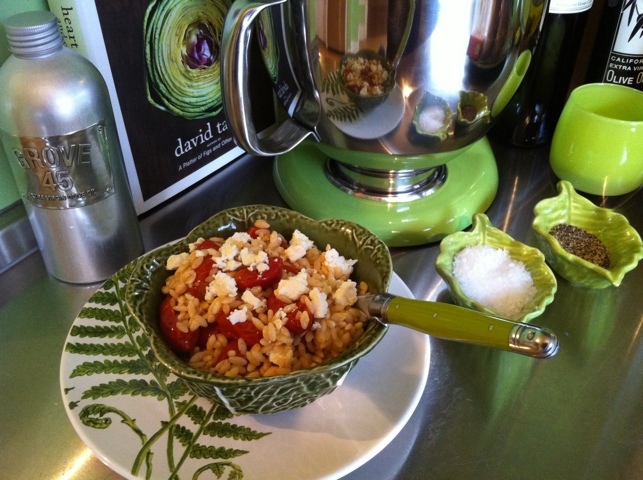 When the tomatoes are done, carefully add all of the contents of the baking dish to the waiting orzo. Let sit uncovered, so the orzo can absorb the incredible liquid of the tomatoes and oil, mixing occasionally. Once it has cooled a bit, add the feta, crumbling or cubing. Your choice. I have been really liking French feta recently, as there is a sweetness to it. Really, any feta you use will be fine. Once you have put the mixture in a dining bowl of choice, add a sprinkling of feta to the top. This is great as a simple meal solo, or perfect next to a piece of chicken or fish. Ever. I get excited about new goods. Often. It is just how I am wired. My feet hit the ground in the morning and I start humming or singing. Badly. But that has never stopped me. When good things are out there, I want people to know about it. Grove 45 Extra Virgin Olive Oil is one of those things. I was first exposed to the gorgeous brushed aluminum bottle with the embossed pewter label on a trip to Napa. It was being sold at a tiny market, and I just could not take my eyes off of that bottle. 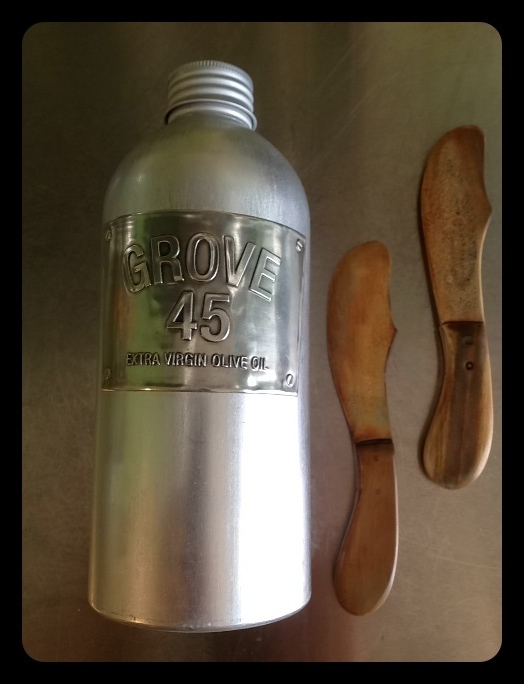 When I contacted the owners of Grove 45 about carrying it at Watson Kennedy, I was told it has a very limited production and that they were sold out, so I put my order in for this year. The bottles arrived yesterday. It was a fun, crazy busy Valentine day at the shop, but my excitement to see all of the beautiful bottles on the shelf could not be contained. Amid all the wrapping of gifts, Olivia & Amy got the boxes opened and all the bottles priced and out onto our shelves. I could not be more pleased to offer this estate bottled EVOO. Grove 45 is organically hand farmed and harvested. It has an intense green color, and a fruity & spicy flavor. What is in the bottle is as beautiful as the container. A double winner in my book.